I’ve received a lot of requests to post my lecture slides from UW students that were at my lecture on New Product Development and attendees who saw my Keynote address on “Leading with Creativity and Innovation” at the EDI 2nd Annual Leadership Conference in late January. Since my slide deck uses almost no text and is heavy with imagery, posting the full deck will be of little value. So instead, I’m going to break up the lectures into a series of blog posts. Across this series, I’ll talk about Product Planning and Product Management, and the New Product Development (NPD) process, all from my perspective of having worked in NPD for around 15 years in several industries, including Automotive, Consumer Package Goods (CPG), Technology, and Videogames and Entertainment. I’ll start off by visually showing the progression of my career in the NPD process. 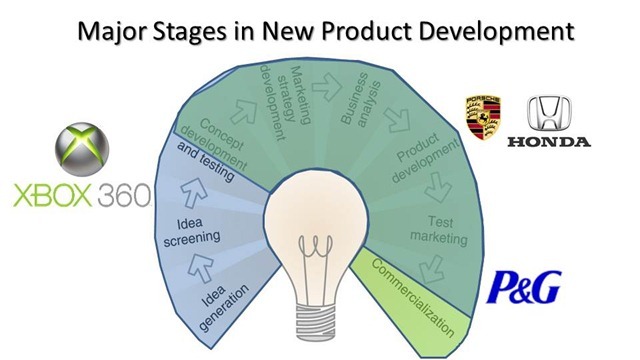 The major stages of new product development can be seen in the image below, courtesy of Detra Montoya, Professor of Marketing at the University of Washington. She uses this chart during her Marketing 301 course, so I like to leverage it when I give my NPD lecture to UW students so they can see the practical, real-world applications of their course material. It’s important to note that the above general stages of the NPD process are specific to a product, and not the overall product roadmapping process or Product Management/Product Planning function. The above assumes that the overall product strategy and roadmap have already been developed, and one is now ready to begin developing new products with clearly established goals/markets/segments, etc. Additionally, depending on the company, industry, and sometimes even the product, the stages may be in a different order, or even parallel instead of sequential. For example, I prefer to do a preliminary business analysis before any concept development/testing, and then a more thorough business analysis before going into development. As a Design Engineer at Honda R&D (Ohio, USA) and Porsche AG (Stuttgart, Germany), my primary focus was Product Development. That is, taking the final concept and engineering a solution (in my case, for the Body Design) to make the concept a reality. 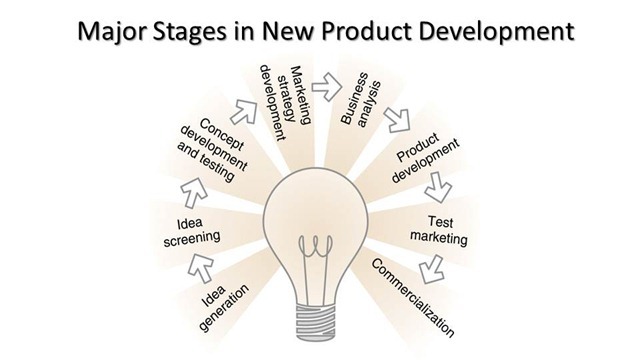 It’s also important to note here that within the Product Development stage you see above, there is also concept development and testing that is necessary to ensure the engineering solutions meet the goals and intent of the product. 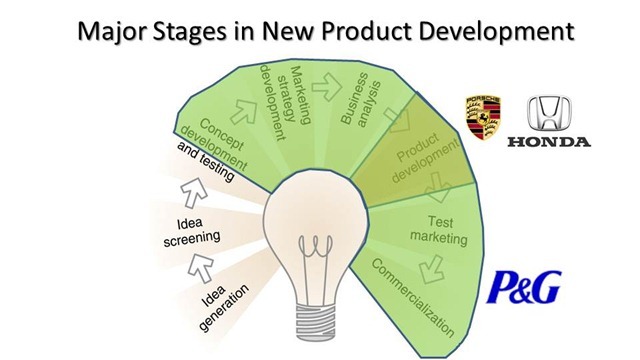 The Concept Development and Testing stage shown in the figure refers mainly to the various solutions available for a particular consumer need or product goal, and market testing those different solutions/concepts with the appropriate consumers to whittle the field down to one direction. Some product testing (vs. consumer testing) also takes place (i.e. in the automotive world, aerodynamic testing would be done on several of the initial clay concepts to narrow the field). 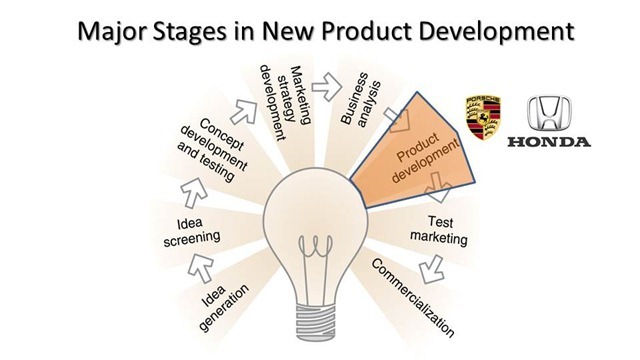 Once one of those concepts is selected for product development, additional concept development and testing occur to meet the defined product goals. Using another automotive example, mounting internal panels could be accomplished through fasteners, plastic tabs, adhesives, etc., which could all be developed and tested to find the best method to meet the selected concept direction. After receiving my MBA at UC Berkeley, I switched from automotive design engineering to marketing, specifically in Brand Management with P&G. At the time, I was hired to focus on the U.S. Hispanic Market, which was done out of San Juan, Puerto Rico, with my brands being Gain detergent and Downy fabric softener. In this brand management role, my responsibilities expanded over a broader range of the NPD process as shown below, with primary focus on go-to-market (GTM) strategies. Since joining Microsoft over six years ago and working as the Global Product Manager / Product Planner for Xbox hardware, my primary focus has shifted to the front end, but still encompasses an even greater portion of the NPD process. That is due to the difference in the NPD process between a typical CPG company (P&G, Colgate-Palmolive, Unilever, etc. ), and most technology and consumer electronics companies. A typical CPG brand manager will own one or two products through the entire product life cycle (from ideation to end-of-life or EOL). At Microsoft, products get handed off depending on its stage in the product life cycle. Product Planners and Product Managers focus on the front end, from ideation to product development. Product Marketers will focus on the commercialization and GTM strategies once the product is fully defined. The advantage of this format in my current role is that I have worked on the front end of nearly every hardware product launched for the Xbox 360 (over 40 shipped products in total). The skills needed to ideate a new product can be quite different from the skills needed to take a pre-defined product to market, so this enables the Product Managers and Product Marketers to leverage these skills across a broader array of products. That concludes this segment on my NPD series. In future segments I’ll elaborate on how to get to the stage of idea generation and give some case studies on prior work. This entry was posted on March 8, 2011, 5:12 pm and is filed under Automotive, Career, Education, Products. You can follow any responses to this entry through RSS 2.0. You can leave a response, or trackback from your own site. Richard, I am a business school student with a major in marketing. What you are describing here sounds magnificent! Like a lot of us, I go through the process of idea generation quite a lot – but feel more cautious about moving on through the rest of the product development process. These charts will help a lot. My question for you as an experience professional is, when I’m looking for a job in product development, which corporate role would make the most sense for a marketing major straight out of college? Thanks a lot. Sasha – many organizations are set up differently, so that will depend on where you apply. Even at Microsoft, for example, different business groups place Product Planners and Product Managers in different areas. Some groups place them under Engineering, other groups place them under Marketing. Additionally, some companies have roles that are more vertically integrated, while others are more broad. So once again, it depends on the company. If you want to jump straight into product development as a marketing major, as above, I would say look for Product Planning or Product Management roles. Alternatively, if you can start out as a Brand Manager, that is a great opportunity in CPG firms where you will have breadth of responsibilities which could include defining product features.